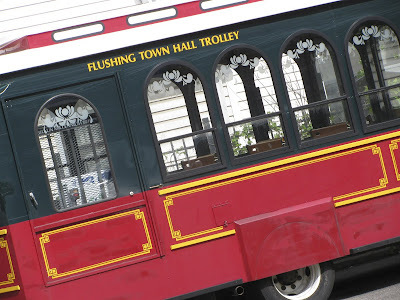 For today's Ruby Tuesday I have the Flushing Town Hall Trolley which caught my eye in the Town Hall parking lot. You can charter it for an occasion for $700./4 hours. Come join us today in posting one or two of your photos with RED in it. Then sign Mr. Linky so everyone will know you have a Ruby Tuesday post up. Oh and don't forget to leave a comment and visit people. Cute trolley - how fun would that be for an event :). Oh the new badge is cute but a little odd lol. :D I'll use it next week perhaps! Old school trains look always elegant! Fun opp! Love the trolly ... sure is expensive tho! Hmm....the new badge ... hmmmm, lol. Mojo said it right - twisted haha. 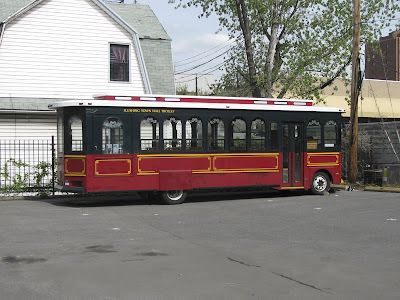 In Ogunquit Maine they have the same trolleys and they are all named with lly. wally, molly, jolly etc. 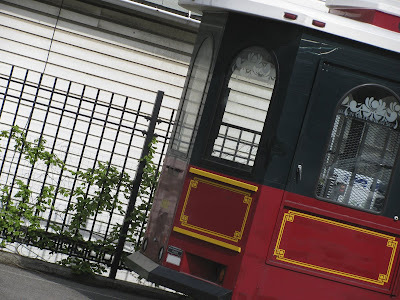 Love the trolley pictures! would be wonderful to go for a ride in it. I love the trolleys! Great angles and that is my favorite shade of red. I'll grab the new badge for next week's post. I'd love to ride on a trolley. Do you know the Trolley Song? I'm always singing it. To me, red makes a trolley. Whether on streetcar tracks or a bus chassis, this transport has a classic look! The trolley shots are very cool Mary! Happy Ruby Tuesday and Cinco de Mayo to you!! your trolley looks inviting. Does it go for real, or is it a museum item? In Norway one Oslo have street carts left, and they are light blue. Also nice, but not when looking for Ruby Tuesday objects. It's gone so far now, that my husband and daughter also are out looking for reds. Your challenge keep spreading like rings in the water. Great shots. I like the angles you used! love the angles of the last two shots! happy RT everyone=) mine's up.. I love trolleys, and this is a beauty. I like the gold trim on the red. Very neatly kept up, that trolley. Oh, and I love the new badge. I'll use it next week! I LOVE the new badge!! That badge reminds me of a saying "Whats a matter house fall on your sister"! Hahahahahaha! I could help myself have a great Ruby T Mary! It's a bit expensive, but I am sure it will be worth it. Love the trolley - great pic! Looks like it would be fun to ride! I love these collection of reds. I'm to cheap for that trolley, but it's a great ruby red post..
Neat subject for your post this week, and the new badge is too funny! Mary, as they say "great minds ...." My post this week is a cousin of yours I think. Surprised at the cost. I attended an event in Chicago where we had two trolleys touring with our group for an evening. No wonder that event was so pricey. Cool trolley! I like the angles you used. ohh that is a cute badge! mine is up already using the old badge. so will start to use that next week. nice entry. is it free to ride on that trolley? I like the new badge, I'm using it now. What a grand and cute old lady! How I'd love to see your world travelling in such style! I love the new badge, and your trolley is very cute! Oh and check the new challenge for tomorrow at my place? Cute toe cover and Trolley! Love the trolley,and love the new badge! I love the trolley. 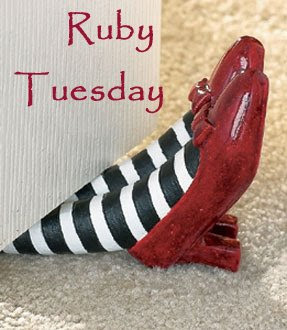 This is my first ruby Tuesday post. I don't take that many pictures with red in them so it's going to be a fun challenge for me. Love the trolley and the badge! I don't see a Mr. Linky this week. Oh, I LOVE this!!! I have a trolly on MY blog today too -- but of an entirely different nature! My post today is entwined with red throughout! Nice trolley, rent it for RT. Then you can take us touring in your hometown. Tons of cameras sticking out of windows. Would be nice, ha? I dunno about Linky today... I've waited and waited -- it's not loading for me! Love your Trolley! Really a beautiful shade of red!! Mine is posted over at my place. Sorry haven't learned how to make a link in comment yet. Have a great day!! Mr. Mr Linky has died today! He disappeared from all blogs today! Mr Linky's web site is down.... Oh well. What fun to drive around town with your friends on a trolley. Is there a lot to see in your town? Nice shot .. ola! Happy Cinco de Mayoooo! I LOVE the new badge! It's just wonderful! Cool trolley too. Didn't play this week, but hopefully I'll be better organized for next week. i lurv the new badge...happy rt everyone. This is my first Ruby Tuesday.... I get hungry with this name as the restaurant has the best salad bar in the world with those dark brown bread croutons... just crispy on the outside but still chewy on the inside. Sigh! Happy Cinco De Mayo, Mary! Your trolley looks like fun, and LOVE the new badge with the Ruby Slippers and the stocking feet of the Wicked Witch Of The East! Made me smile. It's A Blog Eat Blog World ~ mine is a test shot with my cell phone linked to my Flickr account: it worked! This is my first official Ruby Tuesday. I had one last week, too, but didn't know how to deal with Mr Linky. I love an interesting challenge. It would be wonderful to rent that cool trolley for an event. Love the trolley! Thanks for sharing. i like the new badge mary t, but now i have to go back and pack your ruby red dancing slippers into moth balls ha! now see what i did mary t...i put my name in twice and that sure is not a pretty sight either. i think one bad terry is enough. do you think you could delete one of them...painlessly mind you, please..? beloved teach, i do like your new badge.. i hope that pia k comes up to see those adorable striped socks. she dearly loves fancy simple socks like that! i just love that little trolley. you know, here in welland we have so little trains left...or train tracks or the comforting chugging sound of a moving train during the night.....alas..way too much progress, eh teach? I'm in! I love the new badge! I'm also entering a form of transportation this week! Happy WW! I've not participated in Ruby Tuesday before. However the volume of response that you're getting makes it something that I may need to check out! I love trolleys. There's just something about them.